Desperately Seeking a quick Harry Potter project? 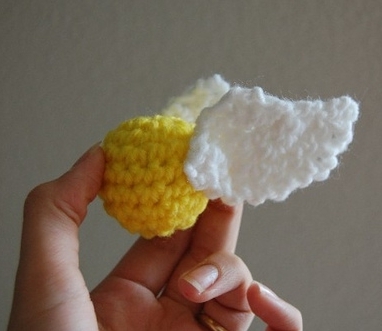 Simple and quick, made using only a few yards of worsted weight yarn and a little stuffing, the Golden Snitch works up faster than you can say Quidditch! Described in the books as "tiny, about the size of a large walnut... bright gold [with] little fluttering silver wings," the Snitch is the most valuable ball in a Quidditch game - and it is, by far, the most difficult to catch. Your crocheted version may not fly, but you'll look far cooler carrying it than a mimbulus mimbletonia!